The beautiful resident yellow Jungmeister against a clear blue sky, photographed on an earlier occasion. 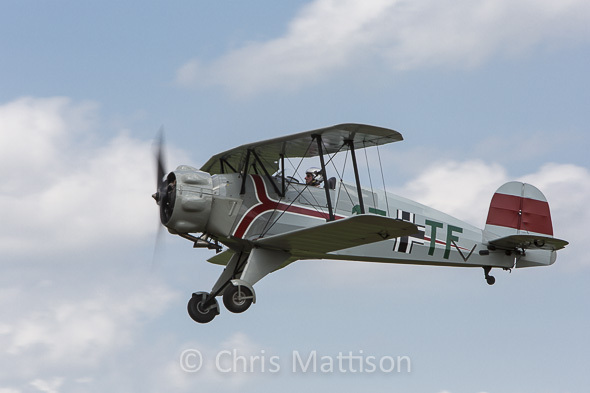 It’s been a long time since we attended an aviation event so the good weather that coincided with Breighton’s fly-in and Bucker-fest was the ideal way to get back into the swing. 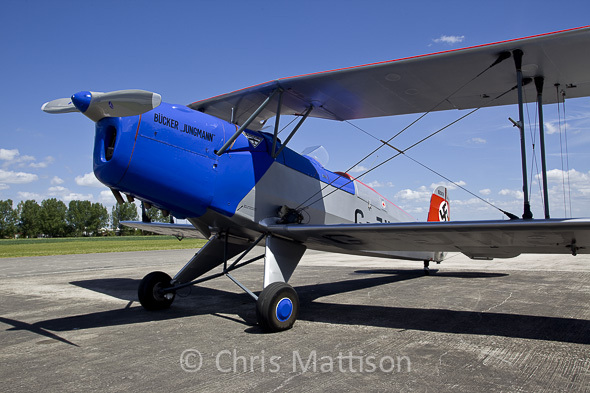 It was good to see some old friends there and to catch up with events at the Real Aeroplane Club. 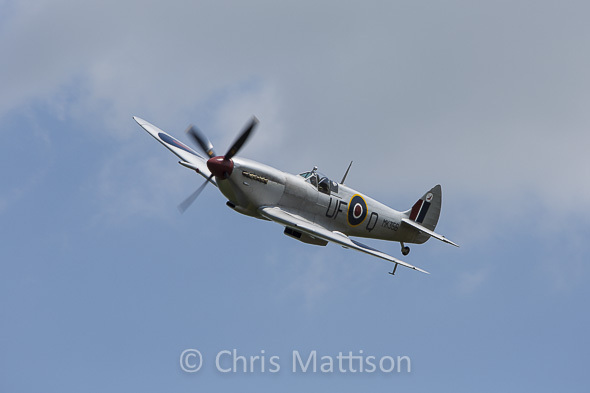 Highlight of the day for most people would have been the Spitfire fly-past, which was over far to quickly, but the Club put up many of its historic aircraft to make sure there was always something going on. Resident CASA Jungmann performing against an ominous sky. Long-time resident Jungmeister gave a spirited display, as usual. 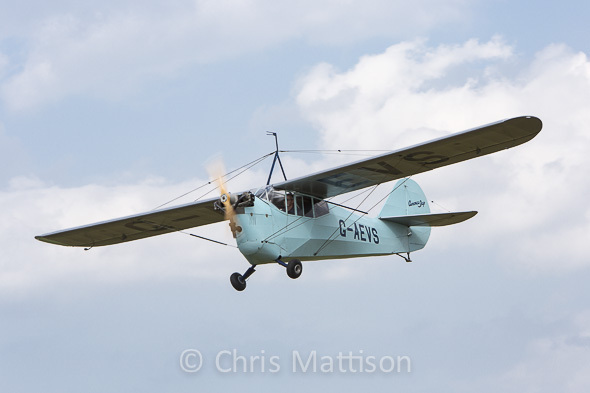 The Club’s 1937-built Aeronca 100, affectionately known as “Jeeves” performed a number of sedate fly-pasts. 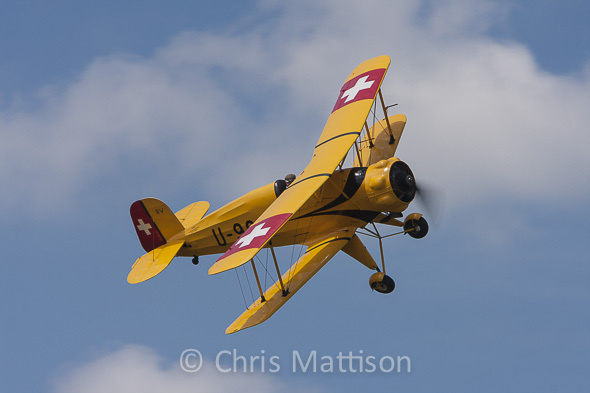 This entry was posted in Aviation and tagged airshow, aviation, biplane, Breighton, Bucker on September 19, 2013 by chrismattison. 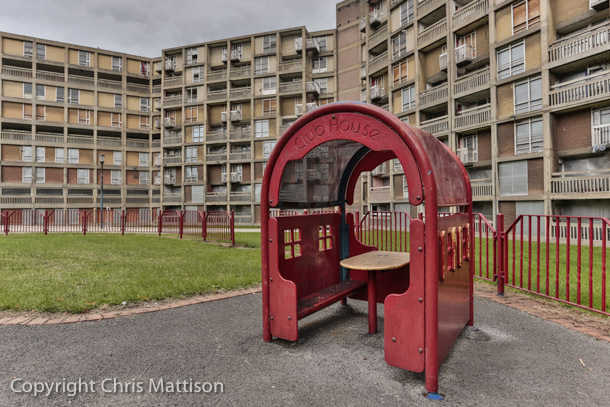 The Park Hill Estate is Sheffield’s most famous, or notorious, modern building. Built between 1957 and 1961, it was part of the city’s slum clearance programme and was intended to be social housing along the lines of some of Le Corbusier’s buildings, with “streets in the sky”, wide enough for milk floats to travel along, and a full range of amenities, including police stations, pubs, shops, playgrounds and schools, on the site. The housing itself consists of four interlinked blocks containing a total of 994 units of one and two bedroomed flats and three and four bedroomed maisonettes. It provided sufficient accommodation for 3,448 people. The concept of “streets” was intended to preserve the working class communities of the older terraces that were being swept away, although, ironically, communities in pre-war Sheffield were traditionally based on courtyards rather than streets, as they were in other British cities. Unfortunately, muggers and other forms of low-life found that they made convenient escape-routes and the vision of streets where neighbours could meet to gossip and socialise never really materialised. Was it a success? In terms of slum clearance it was a huge success. The first influx of occupants found well-equipped, modern housing that was a great improvement on the unhealthy back-to-back houses they had left behind (and which were subsequently demolished). 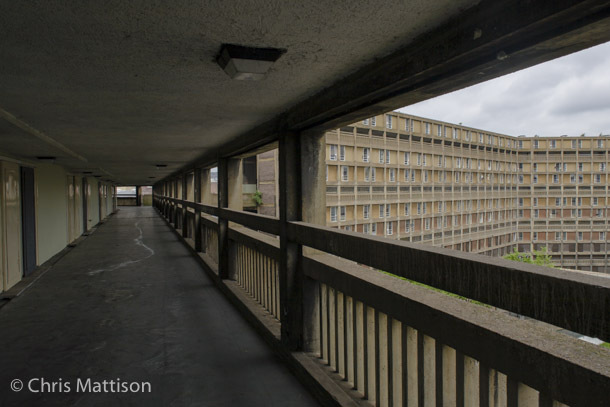 Unfortunately, lack of investment after the flats were completed led to a general deterioration so that they gradually became almost as undesirable as the houses they had sought to replace. 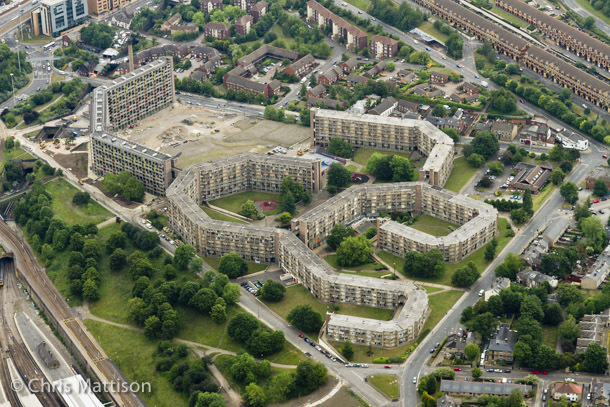 In 1998 Park Hill was listed as a Grade II* listed building – defined as a building of outstanding interest. This met with derision in some quarters, especially with residents, who had already named it “San Quentin”. In 2003, the city council began to plan future work and regeneration of the buildings, together with English Partnerships, the national regeneration agency. 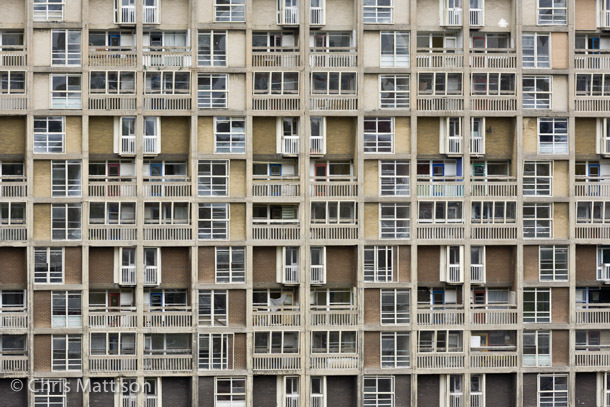 By May 2006, when the first three photographs were taken, the work had just begun, although many flats were still occupied by tenants. Aerial view showing the general layout. The refurbished section is at the top left. Taken in 2012. The financial problems in 2008 obviously had an impact on the project but at the time of writing, in 2013, work is still going ahead and the first lot of units have been completed and up for sale. The developers “Urbansplash” are now responsible for the work. 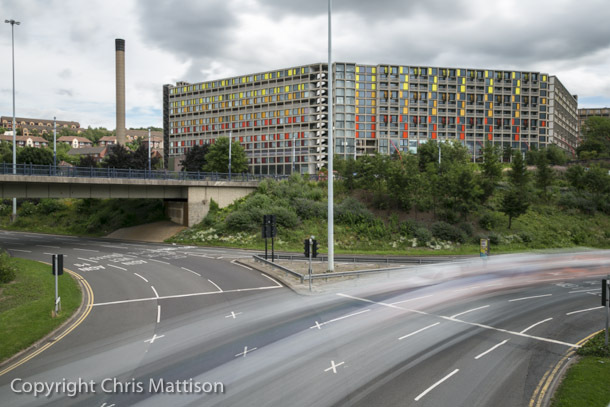 Newly refurbished section of Park Hill, seen from Pond’s Forge. Written material was based on information in the excellent Pevsner Architectural Guide to Sheffield, by Ruth Harman and John Minnis (Yale University Press) published 2004. Additional material was taken from two websites, one from the Open University and other from Sheffield Council that are no longer current. Photographic note: the 2006 photos were taken with a Canon EOS 5D camera, using 24 – 105mm and 70 – 200mm lenses. 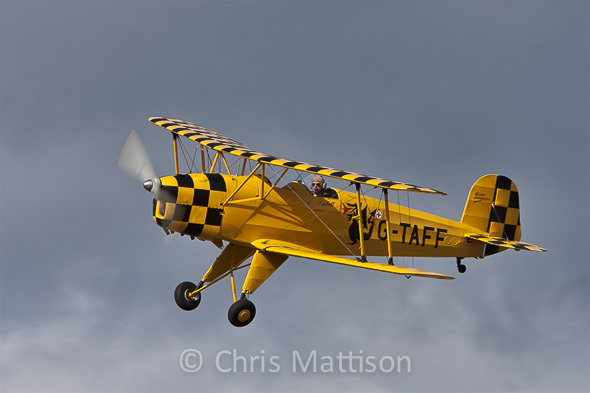 The aerial photo was taken from a Cessna 152 light aircraft using an EOS 40D camera and 24 – 105mm lens and the recent (2013) photos were taken with an EOS 5D Mk3 camera and 17 – 40mm lens. A 10X neutral density filter was used for the long exposure and all images were processed in Lightroom. 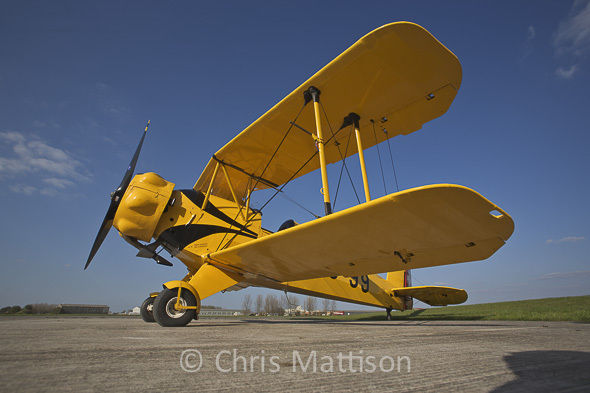 All text and photographs copyright Chris Mattison. Please contact me if you would like to use any of this material. 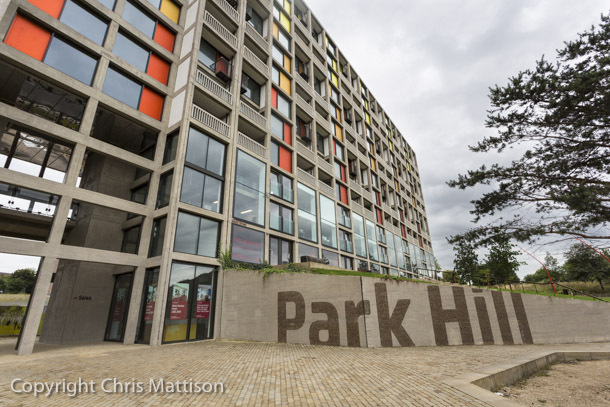 This entry was posted in Architecture, Sheffield, Uncategorized and tagged architecture, Park Hill, Sheffield, social housing on September 7, 2013 by chrismattison. I am a nature photographer and writer by profession but I have a wide range of other interests. These include travel, aviation, design and architecture. The purpose of this blog is to provide a space to publish articles and notes on miscellaneous subjects, not just wildlife. I hope some of them interest you, too. My main website and gallery is at chrismattison.co.uk. For more information please contact me through the main site.